Perennial herb from a compact, erect stem base, covered with withered leaf bases, with a cluster of fibrous roots; stems 1 to several, erect, 5-25 cm tall, usually smooth, not hollow. Basal leaves persistent, kidney- or heart- or egg-shaped to broadly oblong, usually 3-parted, sometimes 3-lobed, the blades 0.5-4 cm long, 0.8-3.7 cm wide, the central segment 3-lobed to entire, the lateral segments 3- to 4-lobed, tips usually rounded, the stalks 1-8 cm long; stem leaves usually absent, sometimes 1 or 2, alternate, shorter-stalked, transitional to the unstalked, 3-lobed to -parted bracts; leaves usually smooth except fringed on margins. Inflorescence a 1- to 3-flowered cyme; flower stalks stout, 2-12 cm long, smooth; receptacle smooth or sparsely soft-hairy; petals 5 to 8, distinct, yellow, broadly egg-shaped, 6-16 mm long, 4-16 mm wide, nectary on upper surface, the scale about 0.5 mm long, smooth; sepals 5, spreading, early deciduous, usually purplish-tinged, 4-8 mm long, 2-6 mm wide, usually yellow wavy-hairy; stamens (20) 40-125; pistils (20) 30-80. Achenes, numerous in a cylindric to egg-shaped head 5-10 mm long, 4-7 mm wide, the achenes egg-shaped, 1.4-2 mm long, 1-1.6 mm wide, smooth or sparsely hairy, margins evident; beaks persistent, slender, 0.6-1.8 mm long, straight or somewhat curved. This highly variable species has sometimes been separated into either three taxa at the specific or varietal level (Brayshaw 1989, Whittemore 1997) or two taxa at the varietal level (Hitchcock et al. 1964, Douglas et al. 1991) in BC. Because large populations of plants, especially in SE BC, sometimes have plants with somewhat pointed leaves as well as the more common roundish leaf tips, some botanists have recognized them as either R. eximius or R. suksdorfii. During a study of R. suksdorfii in W North America, Fisher et al. (1979) were unable to locate the latter species in BC and reidentified BC R. suksdorfii material to R. eschscholtzii. We prefer to treat this complex, at least in BC, as one variable species. Moist meadows, heath, streambanks, shores, scree and talus slopes, and forest openings from the upper montane to alpine zones; common in S BC, less frequent northward; N to AK, YT and NT, E to SW AB and S to CO, UT, AZ, NM and CA. Ranunculus eschscholtzii var. 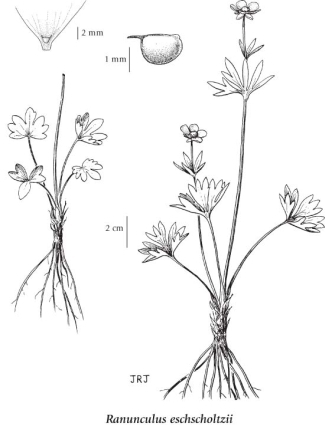 alpinus (S. Watson) C.L. Hitchc. Ranunculus eschscholtzii var. eschscholtzii Schltdl.